I'm basically done with Ironman training for Ironman Canada that's coming up in August. The rest of the month is called "taper" where we get to work out like normal people and rest up our bodies from the last 9 months of wear and tear. Last weekend was intense but I've gotten used to it over the years, a 2 hour run and 1 hour bike ride (indoors) on Friday, a 4 hour bike ride up in the hills on Saturday, and then a 8-9 hour workout on Sunday which was 2 hours on the bike and 50 minutes of running times 3 in the heat. I basically need to watch my weight and nutrition, stretch, stay injury free, and maintain my muscle memory. The best part of taper and for the next couple months, I'm just a big ball of energy so *everything* else becomes so intense it's pretty sweet. There's a reason why people keep doing Ironmans. You can kinda guess why. Here's what this looks like. And here's the "Mac No More" song below. This is from Frog Hollow Farms and costs $25. It's good, but a little pricey. I think you can get it from Dean and Deluca too but they won't tell you that it comes from Frog Hollow Farms. They sell a small version too. So I made this peach galette the other day and making it again soon. I like making strawberry sorbet too in the Summer. I don't know why, I just do so don't bother me. Make the dough with the first 6 ingredients. Put the dry ingredients together the sugar, salt, flour, and butter in a bowl. Mash it up until the butter gets all incorporated. Mix up the buttermilk and water and start putting the water into the dough little by little. Incorporate it in until it starts to look like dough, shouldn't be too sticky. Wrap it up or put in a bowl and put saran wrap over the bowl and refrigerate for a couple hours or overnight. This should be enough for two galettes. Make sure the peaches are ripe, put in a brown bag if not. Peel and slice nicely. Put in a bowl and put in some sugar unless peaches are really, really sweet. Put in the peach schnapps, optional. If you're a drunk like me, put in a couple more tablespoons of peach schnapps. Roll out the dough about 12 inches around. Put the peaches in the center, about 1 cup, and arrange kinda nicely. Fold the dough over the mixture and know that the crust is what makes a galette. Sprinkle some sugar on the crust, might need to wet it a little with a pastry brush. Put in over for 35 minutes in 350 degree oven. Done. Serve with whip cream or vanilla ice cream or Ginger Peach tea. I've seen people change it up by spicing it up with cinnamon or adding raspberries, plums, nectarines or whatever. Hanging out at Caffe Trieste today and who's sitting across from me but Lawrence Ferlinghetti. One of the best fancy dancers in the business. His huge bustles and acrobatic moves (splits and cart wheels) are his signature. He dances fairly mellow and then turns it on big time. This is a quick, basic gravy recipe I picked up from the Somerset Club (this is their poor man's demi-glace). Great for mashed potatoes, beef, chicken, turkey, etc. If you keep the roux light, it's good for biscuits too. Melt the butter. Toss in the flour and stir until brown. The darker the roux the darker the gravy. Toss in everything else and stir. Done. *Long unncessary inside story, but I had Mang Tomas (a sauce for pork) as the "gravy" for a Thanksgiving dinner once and it messed me up badly. It just didn't work. Cut up the eggplant and soak in water to let the sting out. Dry. Heat some olive oil in a dutch oven medium heat. Toss in the onions. Toss in the garlic. Cook for a bit. Toss in everything else. Reduce to low. Cover and cook for about 30 minutes. It's a nice little summer dish. My best friend lives in Naperville, IL, which happens to consistently be one of the "Best Places to Live" according to Money magazine. So here's Naperville. Here's Oakland. And a comparison tool for Oakland against San Francisco and the top 100 places to live. In summary, we have better weather in Oakland but we're illiterate, bad at math, and we're stressed because we don't vacation enough. However, we do have a Racial Diversity Index of 651.5 which might be the highest in the Country. 100 is National Average, San Francisco is at 267, closer to 0 is a more homogenous population. Interesting data. To improve Oakland, we need to understand what the metrics are so that we can actually improve them. I'm reading Implementation and hope to finish it in the next couple of weeks. I finally got around to scanning this photo, I guess being in the Computer History Museum this week for Mashup Camp kinda motivated me to get this up finally. This is kinda the original Firefox and Thunderbird team with marcia and the whole several thousands of people in the Mozilla community and ex-Netscape people missing. No one person started Firefox you see (Thunderbird, on the other hand, is all mscott and bienvenu). What makes this a classic Mozilla photo, is the stupid ethernet cable that's running from the ceiling (and yes we did try to move it, that's why we're all smiling). It's one of the reasons why this photo never got published. So classic. Maybe this becomes one of those famous old school computer photos, with everyone in it getting all rich and famous. Let’s hope so, because I’m in there :-) (eh, I'm already "rich" and "famous"). 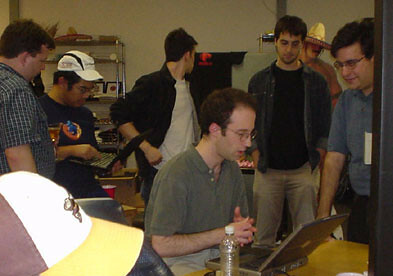 I have another photo that’s more representative of those involved in Firefox because there was quite a number of people involved in making it happen.Anyway, that’s Blake (looking at the Rock) and Joe standing next to him. They just sold their company Parakey to Facebook. Very cool. I forgot to ask for their autograph. eh, I’ll take a Facebook t-shirt (which will end up going to Dad) and a free lunch. That’s Ben all the way to the right and he’s at Google now. dbaron, extraordinaire, fixing something I’m sure in front of his laptop. I’m there on my computer with cbeard and we’re finalizing the press release announcing Firefox 1.0. I’m about to publish it (after about the umpteenth cbeard edit). And then Asa actually cropped this image and just shows Jay’s hat because he’s drinking a margarita or something that brendan probably made for him. That was fun…Ok, back in the garage. *Update*. I take stuff down all the time. Sorry Blake.